The other morning when coming in to the office, I was met with this poster on the entrance door, announcing a seminar “Comment Modéliser La Resource Éolienne” (“How To Model Wind Energy Ressources”), to be held on our campus, in the Drahi Entrepreneurship center, on February 23, 2017. The seminar is with Alexandre Brouste (Université du Maine), Marie-Noëlle Bouin (Météo France), and Josselin Garnier (Ecole polytechnique). Here’s a link to the seminar announcement. Of course, I know my colleague From Ecole Polytechnique, Josselin Garnier – but I did not know that he cared about wind energy. And, I do not know the two other speakers at this seminar. 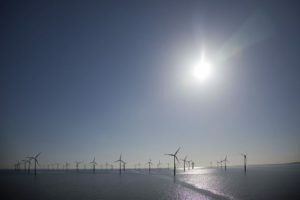 But, being a citizen of Denmark, a country with an almost 40 year history in pioneering wind energy , whose energy needs today are 40% satisﬁed by wind turbines, and which, at exceptional times, generates 150% of its energy production from wind energy, I can of course only approve, and am intrigued. Aside from harbouring an accidental ecological streak, renewable energy indirectly intrigues me scientifically: a potentially highly variable energy production requires matching demand to production (and not, as is the case currently, the inverse) is a strong motivator for development of the Smart Grid – especially for more advanced (and challenging) communications patterns for “monitoring and piloting the grid”, rather than the relatively pedestrian task of “remotely reading power meters”.